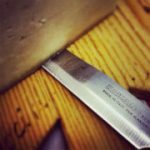 Last Update Mar 2019 – Everyone loves a good toasted sandwhich but one thing about the older style sandwhich presses was that they were difficult to clean and didn’t really get that hot. Well these days toasted sandwhich grills have taken it up a notch and you can basically use them as a grill for everything from bacon and eggs to cuts of meat. One that has been making waves recently is the Breville Smart Grill BGR820XL – Lets have a look at why it is said to be a cut above the rest. What exactly is this Breville Smart Grilling Machine? This indoor grill from Breville is an answer to all your grilling needs. Quite often, people complain that the results that you get with an indoor grill are not as great as the ones you get with an outdoor grill. But this breville smart grill would put all such apprehensions to rest as it is a high power grill that can cook food quickly and at high temperatures. It preheats extremely fast, and reaches the desired temperature quickly. It comes with an efficient thermometer that helps maintain accurate temperature and has 6 different heights and special settings for different cooking modes which makes it an extremely efficient grill. With this grill, you can achieve temperatures between 310 to 450 degrees which means you can grill everything from fish to steak. 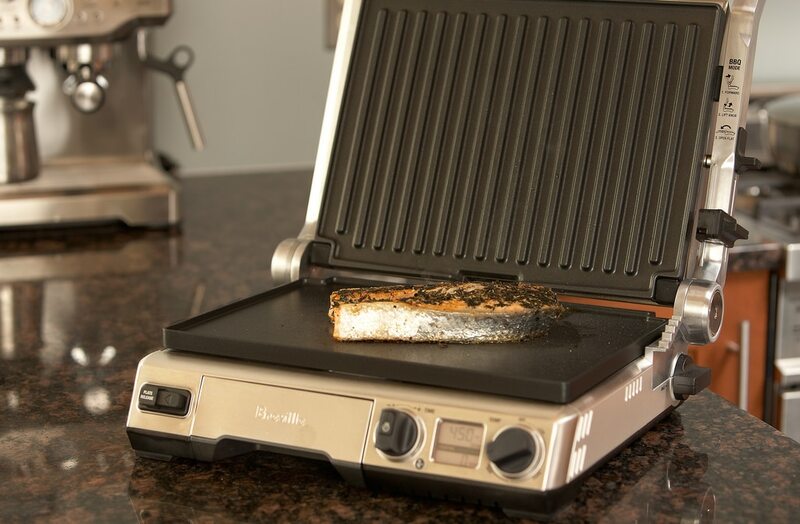 What Sets the Breville Indoor Grill Apart? This particular indoor grill utilizes technology which they call Element IQ. The grill plates have built-in heat sensors. What these do is, whenever cold food is laid on the preheated surface of the grill, they immediately inject heat onto the plate. The rapid recovery from the dip in temperature back to the desired temperature ensures that the flavors stay in the meat. Let’s say you want to grill a frozen burger patty, on regular grills, the cold patty will lower the temperature of the surface and it could take some time for the heat to go back up. By then, all the juices from the meat could have leaked out. With the Element IQ, the grilling surface remains hot and sears in the flavors. Almost all food, including chicken, stays moist because the juices do not escape. Another feature that sets the Breville indoor grill apart is the integrated heating elements. In most indoor grills, the heating elements are exposed. The plate heats up from the contact to the heating elements. This kind of set-up results to too much heat loss that leads to longer cooking time. We all know that the longer you cook meat, the tougher it becomes. Not so for the Breville BGR820XL Smart Grill. It is one of the few brands that utilizes integrated heating elements so the heat is directly transferred to the grilling plate. There is very minimal heat loss, allowing the plate to maintain the desired temperature effectively. Plus, the grill plate quickly heats up. You can start cooking faster than if you use a conventional indoor or outdoor grill. The Breville indoor grill also comes with a Timer Control Dial. Just like an alarm clock, all you need to do is set the cook time for your food and wait for the alert. You won’t need to stay in front of the grill for the duration of the grilling time. You can spend your time doing other things, like preparing more food, while waiting for your chicken or fish to grill. Finally, the smart grill has a dial for temperature control. This makes it possible for you to choose the cooking temperature setting depending on what you will be grilling for that day. It even has a switch that allows you to view the temperature in either Fahrenheit or Celsius. 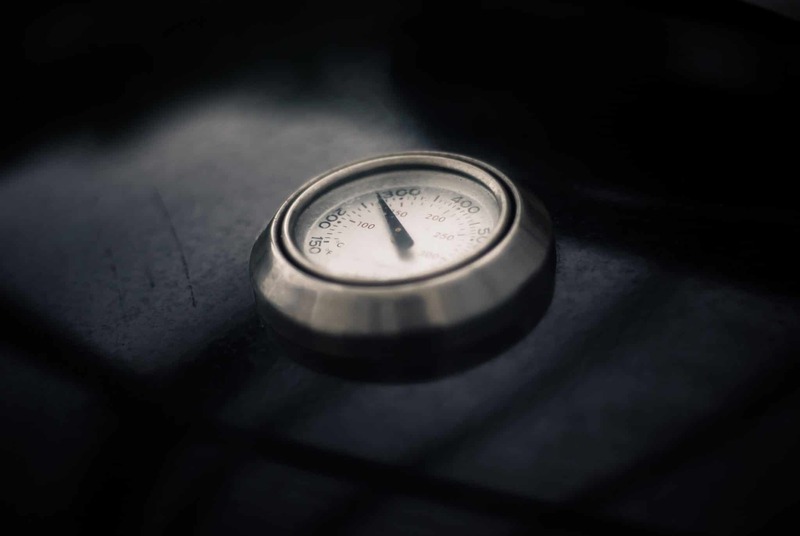 This feature may seem trivial to some but it eliminates the need to buy a separate thermometer just to keep track of the cooking surface temperature. What Are the Advantages of The Breville Griddle Plate? Most people may think that the grill and the griddle are the same. They are actually two different surfaces for cooking. The grill plate has ridges and is great for cooking steak and chicken. It leaves the striped char marks on the food. The griddle, on the other hand, is flat like a frying pan. Just like a frying pan, the griddle plate is ideal for cooking hotcakes, omelettes, hash browns, and grilled cheese sandwiches. The flat cooking surface makes it so easy to flip the food with a spatula. The advantages of having the Breville griddle plate is that it heats evenly throughout because of the embedded heating element. This means whatever you’re cooking on its surface is heated evenly the whole time. Unlike if you are cooking on a stove-top griddle, where some parts are already searing hot while others are still cold, your food gets cooked with no burnt edges and uncooked areas. With the Breville griddle plate, you’ll be able to churn out perfectly cooked grilled cheese sandwiches every time. Also, since you can adjust the tilt level of the plates, you can adjust the base so the excess oil drains away from the food. No more soggy, oily bacon strips for breakfast! This smart grill gives you the freedom to grill your food from the convenience of your kitchen, whenever you want. Whether you want to grill Panini for breakfast or make a steak dinner, this piece of equipment can do the job. So, even if it’s raining or snowing outside, you can still have that barbeque dinner that you’ve been craving for. Perfect for singles or couples in smaller apartments or for families with kids who love toasted bagels the breville smart grill bgr820xl can cater for pretty much anyone. It is economical enough to use in preparing a meal for one but it can accommodate a lot of food should it be required. Plus, if you need to prepare an extra-large amount of food, for a party perhaps, you can use the Breville Smart Grill as an extra cooking surface together with your stove. It is also ideal for people who are watching their weight or just want to eat healthier. Grilling burgers or steaks on the Breville Smart Grill using the grill plate separates the meat from the excess oil that drips from them. In one trial conducted by a consumer, the amount of oil he was able to extract from burger patties reached 1.5 ounces. On a conventional frying pan, the oil will simply be reabsorbed by the meat because it has nowhere else to go. Grilling is also great for vegetables. They retain more of their minerals and vitamins when grilled than if they were boiled or sautéed. It is a great choice for people who find handling the conventional grills cumbersome. Using this smart grill is a breeze, and you can grill a variety of food items in a hassle free manner. You can use it in the Panini setting where you only use one-half of the cooking surface and press the food down with the top plate. Or, you can open the grill up and use both surfaces at once. You can grill your burger patties and hotdogs on the grill plate while toasting the buns on the griddle plate. It is light enough to carry around so you can bring the grill to a friend’s house and have your barbeque there. You can also bring it to a tailgate party, as long as you have somewhere to plug the grill in. The Breville smart grill has a reasonably large size to accommodate a good amount of food at a time, but it can be locked and tucked into any of the kitchen cabinets when not in use. It is perfect for students who live in dorms or couple who are just starting out in a tiny apartment. You can even store the grill on top of your other appliances. Just make sure that the grill plates are cool enough before placing it anywhere that can potentially melt or start a fire. So, whether you have a small condo or a huge house, this smart grill will make a great investment. What benefits can I expect ? The Breville bgr820xl is a highly functional and efficient kitchen appliance. At 1800 watts, this grill has a much higher power than any other indoor grill that you will find on the market.So powerful that it can fully cook a completely frozen burger patty in less than four minutes. Conventional grills often take about ten minutes to do the same. It doesn’t take long to preheat so expect to start grilling a few minutes after you’ve set it up. The griddle plate and the grills heat up using smart technology, which allows it to compensate when it notices cold food on the plate, it then injects extra heat to bring the temperature back up to the correct level. This feature makes it comparable to most outdoor grills. One advantage that the smart grill has over outdoor grills is that it doesn’t need troubleshooting when it gets wet in the rain. Imagine having to unscrew knobs, dry-off the igniter tip, or check on the battery pack of the grill before even preparing the food for grilling. That’s too much work just for cooking a couple of steaks. It is adequately sized to hold a reasonable amount of food for a group of people. The grease tray gets conveniently pulled up without spilling the oil, and cleaning this grill is extremely simple. Most of the time, it only requires a quick wipe down to remove the grease. It’s that easy to clean. Speaking of convenience, there is very little prep time involved in using the Breville Smart Grill. For most outdoor grills, you’d have to empty the ashes from your previous grilling session, fill the grill with charcoal, then light it up. Even with gas grills, you would still have to wait around 30 minutes to preheat the cooking surface. With the Breville Smart Grill, all you have to do is switch it on and set the temperature based on what you need to cook. Now all you have to do is wait for the grill to alert you that it is ready to cook. The griddle plate and grills are dishwasher safe, so after a quick rinse the dishwasher takes care of the rest. With the non-stick coating on the plates, you won’t have to scrub sticky food off the surface. There is no need for scraping off burnt food residue or emptying of charcoal ashes. It is actually not advisable to scrape food off the grill plate especially if you are using a metal spatula. It is a highly versatile grill, and lets you cook a variety of recipes. You can achieve precise temperatures, and the 6 different height settings give you immense control over the heat. You can also cook food of varying thickness. All you need to do is adjust the top plate to avoid squishing your food too much. Or, just leave the grill open if you don’t want to flatten your food. This handy little grill from breville is designed to last, so you can expect it to serve you for years without requiring much maintenance. It is slightly difficult to find any faults with this grill, but the only thing that can turn off some people is the price. Its price is slightly higher than the other indoor grills available on the market but as they say, you get only what you pay for. The price may be double the regular grill but its unique features alone are already worthy of that. What Should I Watch Out for When Using the Breville BGR820XL Smart Grill? Here is a rundown of things that people should watch out for when using this particular indoor grill. Note that these are not really big issues, rather they are minor complaints that other customers have been posting about the product. As mentioned above, the indoor grill’s top plate can be adjusted. It has six settings designed so that any food thickness, be it sandwiches, thick slabs of beef, or thin strips of chicken, can be cooked using the Panini setting without flattening the food. However, despite the different settings, most of the soft food tested by the posters ended up getting squished. The problem is rooted on the weight of the top plate. So, if you want to make grilled sandwiches, expect it to come out a little flattened, particularly if you use soft bread. There is one customer who mentioned the length of the grill’s power cord. She claims that it was shorter than expected, so she was forced to grill close to a power socket. This shortcoming, pun intended, can be easily solved by using an extension cord. As long as you have that, you can basically grill anywhere. Another minor complaint is experienced by those grilling meats. They claim that, sometimes, the blood, from the meats being grilled, clumps up once it gets cooked. These clumps tend to block the path to the main grease tray. This results to oil creeping down the side of the grill and pooling behind and underneath it. Ut can be surmised that small pieces of food can clog the oil tray as well. Again, this is not entirely a disadvantage as it is also experienced by those who bought other brands of indoor grills. However, it is an inconvenience that could have been addressed by Breville in their design. One other complaint related to oil messes came up from customer reviews. They said that, when you are cooking something oily (like fatty pork or beef steaks), expect some oil to splatter. Of course, this is also true for any other cooking equipment and can be quickly fixed by a giving your countertop a wipe down. All you need is a rag and some warm soapy water and wipe the areas splattered with oil. You can also buy an adjustable splatter shield to go around the grill. What’s good about the Breville indoor grill is that it can easily be moved when you are cleaning the splatters. Another minor issue is, if you want to leave grill marks on your meats, like your steak or hamburgers, you would have to flip the meat once the desired doneness has been achieved. Having to flip defeats the purpose of the clamshell design. Of course, this wouldn’t matter much to the regular cook but can be something to think about for those who want their food to look a certain way. You can always purchase extra griddle and grill plates for your Breville BGR820XL so you can cook with the same surface on both sides. Speaking of buying extra plates, some consumers who have already purchased this smart grill complained that the non-stick coating tend to come off quite easily. Some complaints mentioned the coating lasting for only 6 months, while others claim that theirs were good for 11 months. One way to avoid this peeling is to wash the plates gently. Don’t use anything abrasive that can damage the surface. Using metal cooking implements may also damage your cooking surface. If possible, stick to silicon spatulas. It is multi-functional, high-powered cooking equipment. It has Element IQ that adjusts automatically to avoid heat loss while grilling. It is very easy to clean and store. It has a large cooking surface so you can grill more food at one time. The top plate is adjustable to 6 different heights to avoid pushing down on the food. It is pricey, twice that of other similar indoor grills. The oil tray can get clogged, letting the used oil flow down under the grill. The power cord is a little short. Many say that outdoor grills are superior to indoor grills because they infuse the food with incredible taste. With the Breville BGR820XL Smart Grill, you get the combined features and convenience of both indoor and outdoor grills. The flavors of the food stays locked inside. The Breville bgr820xl smart grill is undoubtedly a great product for anyone looking for a high quality benchtop grill. It is easy to clean and offers the quality of an outdoor gas grill, but in the convenience of your own kitchen. By looking at the pros and cons list alone, you can see that this product shines more than the disadvantages and is worth purchasing.